Here's a quick list of some possible solutions, with their impacts (+ positive, - negative, = neutral) on the three problems. Those nice people at theyworkforyou.com are having a hard time persuading parliament to catch up with the 21st century version of the web. Not surprising really, since for the most part they've got about 150 years of catching up to do. 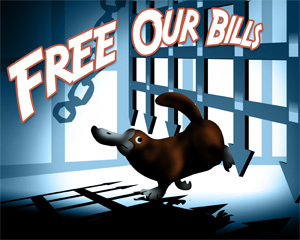 It's a fairly technical campaign, but if you click on the platypus, they'll explain it gently. Saudi Arabia's King Abdullah has effectively announced that peak oil is upon us (Reuters), also reported by evworld with extensive commentary. All the speculation about when peak oil will occur has been made with certain assumptions about what Saudi Arabia can do. Now, they've effectively said "that's your lot". They're not going to increase production capacity after next year, and they're going to keep about 10% of their capacity in reserve. That's huge news, given that they have 25% of the world's oil reserves, and are the largest oil producer and the largest exporter. Russia, second, have already announced that they can't produce more. The US is third in production, and have been in decline since the seventies. While large reserves have been found in Canada, the Canadian government has said that production there must be CO2 neutral, and in any case that oil is going to be very expensive to bring to market. What this means is that there's no doubt in my mind that oil global oil production has now peaked, or will do so next year. The good news though, is that this economic prudence means that the decline in production will be slow. Whether this will be economically disastrous depends on whether the world can manage its oil consumption properly. Sadly, none of this will necessarily help with climate change. The danger is that coal fired power stations, and coal to liquid technology will take off. Oh, and of course there's plenty of coal and gas left to ruin the climate. At the suggestion of John Hemming, MP, I've set up a mailing list for Liberal Democrat activists who are interested in peak oil. Any member of the Liberal Democrats can subscribe to the list at http://lists.libdems.org.uk/wws/subscribe/peakoil/. You may need to register your email address - and you'll need your party membership number to do so. Congratualations to Lewes FC! Their 2-0 victory over Dorchester today wins them the Conference South competition. Next season, they'll be playing in the Conference, which means that their results will be reported on TV. They'll be playing against the likes of the mighty Histon, and maybe Cambridge United (teams from my home town). Local rivals Eastbourne finished second. That puts them in the playoffs, so they could join Lewes in promotion. The US Army has published a report "Energy Trends and Their Implications for U.S. Army Installations". On page 8: "Oil production is approaching its peak; low growth in availability can be expected for the next 5 to 10 years." They don't say what will happen next, though. Encouragingly, when talking about security implications, they're not lobbying for more work, but say: "A more equitable distribution of resources is in our best interest for a peaceful future"
The FT reports that Leonid Fedun, vice-president of Lukoil says Russia's oil production has peaked. Why does that matter? Because Russia is the world's second largest oil producer, just a shade behind Saudi Arabia, and a shade in front of the USA. All these countries produce more than double the amount that Iran, placed fourth, does. It's also the second largest oil exporter, way ahead of Norway (yes, Norway) in third place. The USA's production peaked decades ago, and Saudi Arabia is notoriously secretive about its reserves and future production capacity, and there's been a notion that we're going to increasingly rely on Russia for energy in the future. Well, not now, we're not. Basically, the future of oil is down to whether Saudi Arabia can turn up the the pumps, or whether some new reserves will magically appear. It doesn't snow much in this part of the world. Today we had the heaviest snow fall that I've seen in the past decade, though. Buffey came out to play.